Waldorf's Kaila Jackson (Upper left), photo courtesy WU Sports Info. Clarke's Makenna Haase (Lower left), photo courtesy Clarke Sports Info. Iowa Wesleyan's Jarryd Fernandes (Upper right), photo courtesy IW Sports Info. 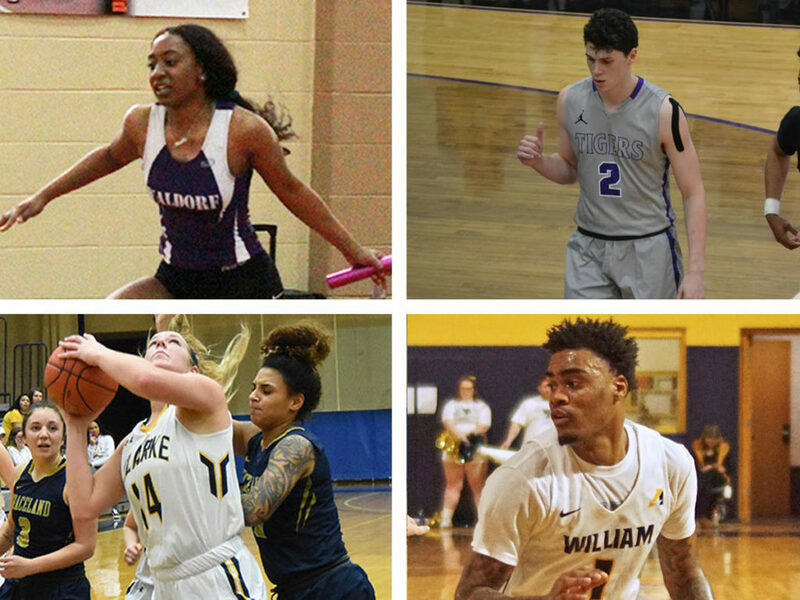 William Penn's Abrian Edwards (Lower right), photo courtesy WPU Sports Info. 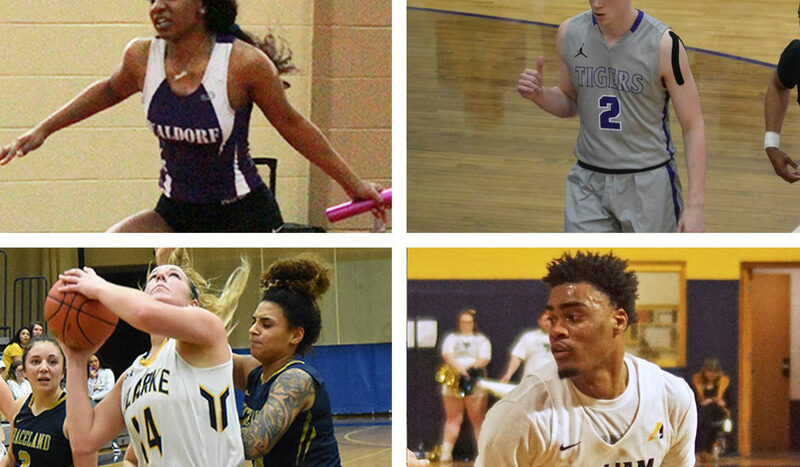 This week’s Iowa college Players of the Week are Makenna Haase, CU; Kaila Jackson, WU; Jarryd Fernandes, IW; and Abrian Edwards, WPU. The Pride went 2-1 last week, 1-1 against ranked opponents. Haase made noise on the court to the tune of three double-doubles. Her points/ rebounds totals looked like this: 23 and 13 against William Penn, 23 and 15 against Central Methodist and 10 and 17 against Missouri Valley. Back-to-back appearances as an ISN Player of the Week for Jackson. Of course, when for the fourth consecutive week, she is breaking her own school records. This week, she knock more time off the 60m, running it at 7.86 at the South Dakota State Indoor Classic. The Tigers have struggled this season, but the sophomore from Australia has shown fans that the future could be bright. Fernandes averaged 34.0 points and 10.0 rebounds per game last week, but realistically did the bulk of that work in a tough loss to Greenville. He made 21 field goals (a new school record) and scored 51 points total (tying a school record) while collecting 13 rebounds in the 128-125 setback. The senior did his part for the Statesmen, who split again last week. Edwards recorded his second triple-double of the year and nearly averaged a triple-double for the week. He put in 17 points, 10 rebounds and 10 assists in a win over Baker, while earlier in the week knocked down 20 points to go with eight boards and eight assists.